transfer to Hotel Imperial or similar. Dinner and overnight at hotel. After breakfast, transfer to airport to connect flight for Jammu. Arrive Jammu and transfer to Hotel Asia Jammu-Tawi to deposit the baggage with hotel security. 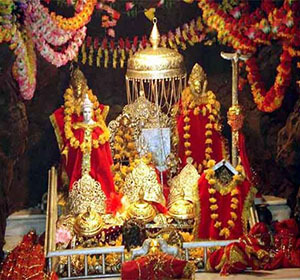 Even though the holy shrine of Vaishno Devi is 61 kms from Jammu, the aura and the influence of the Goddess can be seen and felt as soon as one lands at Jammu. After lunch and a short break, leave for Katra by car - coach around 1700hrs. Arrive Katra at about 1900hrs and begin the Yatra on foot to the temple of Vaishno Devi (14kms - 6hrs). Arrive the temple of Vaishno Devi - world famous holy shrine where your prayers are answered - at around 0100 hrs. The legend runs that over seven centuries ago Vaishno Devi was an ardent devotee of Lord Vishnu. Bhairon Nath, a tantric, was bewitched by Vaishno Devi and gave her a chase when she was going towards Trikuta Mountains. When thirsty, the Goddess shot an arrow into the earth and water gust-out at the place where the Ban-Ganga exists today. The imprints of her feet marked the spot Charan Paduka where she rested. She meditated in the cave at Adhkwari. Since Bhairon Nath took nine months to locate her, the cave is called Garbh Joon. When found by Bhairon Nath, the Goddess made her way out by blasting an opening with a trident. When she arrived at the holy cave at Darbar, she took on the form of Maha kali and chopped-off the head of Bhairon Nath. A temple after his name stands where the head fell on the ground. We spend about 2-3hrs at the temple for Darshan and Prasad and walk back to Katra at about 1000 hrs after breakfast at local restaurant. Start by car - coach for Jammu, reaching there around noon. Check-in and lunch at Hotel Asia Jammu-Tawi. Day at leisure to relax and recuperate. Dinner and overnight at hotel. After an early breakfast, proceed for a full-day excursion to Patnitop (112kms) with packed lunch. With all the exquisite beauty of a hill-station, it is a charming little plateau at an altitude of 1950m, where the time seems to stand still. The meadow is surrounded by dense woods and lush greenery of tall pines. Arrive back to Jammu around late evening. Dinner and overnight at hotel. After breakfast and lunch, transfer to airport for flight to Delhi. Arrive Delhi and transfer to Hotel Imperial or similar. Evening, city tour of Delhi, visiting Laxmi Narayan Temple. Hanuman Mandir and India Gate. Dinner and overnight at hotel. After breakfast, transfer to airport in time to connect flight for onward journey - back home.